"But historians believe events like the rally in Wedding helped the Nazis build a dictatorship. Yes, the brawl got them media attention. But what was far, far more important was how it fed an escalating spiral of street violence. That violence helped the fascists enormously. Violent confrontations with antifascists gave the Nazis a chance to paint themselves as the victims of a pugnacious, lawless left. They seized it. It worked. We know now that many Germans supported the fascists because they were terrified of leftist violence in the streets. Germans opened their morning newspapers and saw reports of clashes like the one in Wedding. It looked like a bloody tide of civil war was rising in their cities. Voters and opposition politicians alike came to believe the government needed special police powers to stop violent leftists. Dictatorship grew attractive. The fact that the Nazis themselves were fomenting the violence didn’t seem to matter. One of Hitler’s biggest steps to dictatorial power was to gain emergency police powers, which he claimed he needed to suppress leftist violence..."
After the murder of Heather Heyer in Charlottesville, many people are asking themselves what they should do if Nazis rally in their city. Should they put their bodies on the line in counterdemonstrations? Some say yes. History says no. Take it from me: I study the original Nazis. We have an ethical obligation to stand against fascism and racism. But we also have an ethical obligation to do so in a way that doesn’t help the fascists and racists more than it hurts them. Charlottesville was right out of the Nazi playbook. In the 1920s, the Nazi Party was just one political party among many in a democratic system, running for seats in Germany’s Parliament. For most of that time, it was a small, marginal group. In 1933, riding a wave of popular support, it seized power and set up a dictatorship. The rest is well-known. It was in 1927, while still on the political fringes, that the Nazi Party scheduled a rally in a decidedly hostile location – the Berlin district of Wedding. Wedding was so left-of-center that the neighborhood had the nickname “Red Wedding,” red being the color of the Communist Party. 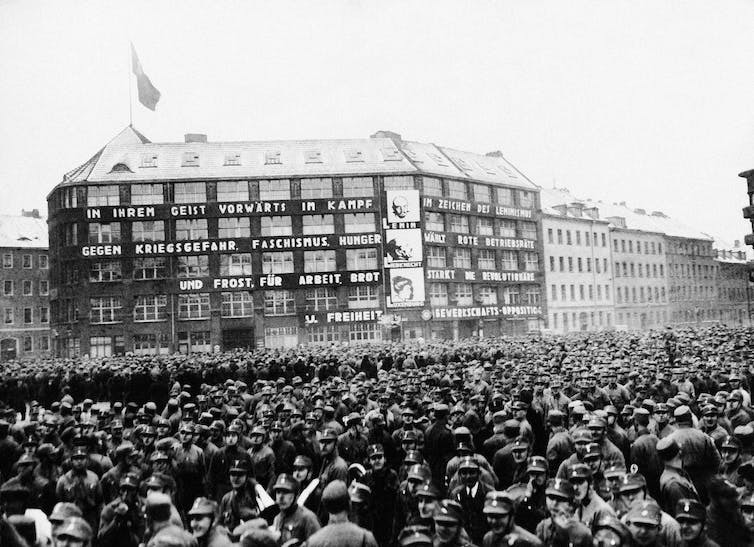 The Nazis often held rallies right where their enemies lived, to provoke them. The people of Wedding were determined to fight back against fascism in their neighborhood. On the day of the rally, hundreds of Nazis descended on Wedding. Hundreds of their opponents showed up too, organized by the local Communist Party. The antifascists tried to disrupt the rally, heckling the speakers. Nazi thugs retaliated. There was a massive brawl. Almost 100 people were injured. I imagine the people of Wedding felt they had won that day. They had courageously sent a message: Fascism was not welcome. But historians believe events like the rally in Wedding helped the Nazis build a dictatorship. Yes, the brawl got them media attention. But what was far, far more important was how it fed an escalating spiral of street violence. That violence helped the fascists enormously. It worked. We know now that many Germans supported the fascists because they were terrified of leftist violence in the streets. Germans opened their morning newspapers and saw reports of clashes like the one in Wedding. It looked like a bloody tide of civil war was rising in their cities. Voters and opposition politicians alike came to believe the government needed special police powers to stop violent leftists. Dictatorship grew attractive. The fact that the Nazis themselves were fomenting the violence didn’t seem to matter. In the court of public opinion, accusations of mayhem and chaos in the streets will, as a rule, tend to stick against the left, not the right. This was true in Germany in the 1920s. It was true even when opponents of fascism acted in self-defense or tried to use relatively mild tactics, such as heckling. It is true in the United States today, where even peaceful rallies against racist violence are branded riots in the making. Today, right extremists are going around the country staging rallies just like the one in 1927 in Wedding. According to the civil rights advocacy organization the Southern Poverty Law Center, they pick places where they know antifascists are present, like university campuses. They come spoiling for physical confrontation. Then they and their allies spin it to their advantage. I watched this very thing happen steps from my office on the University of Washington campus. Last year, a right extremist speaker came. He was met by a counterprotest. One of his supporters shot a counterprotester. On stage, in the moments after the shooting, the right extremist speaker claimed that his opponents had sought to stop him from speaking “by killing people.” The fact that it was one of the speaker’s supporters, a right extremist and Trump backer, who engaged in what prosecutors now claim was an unprovoked and premeditated act of violence, has never made national news. We saw this play out after Charlottesville, too. President Donald Trump said there was violence “on both sides.” It was an incredible claim. Heyer, a peaceful protester, and 19 other people were intentionally hit by a neo-Nazi driving a car. He seemed to portray Charlottesville as another example of what he has referred to elsewhere as “violence in our streets and chaos in our communities,” including, it seems, Black Lives Matter, which is a nonviolent movement against violence. He stirred up fear. Trump recently said that police are too constrained by existing law. 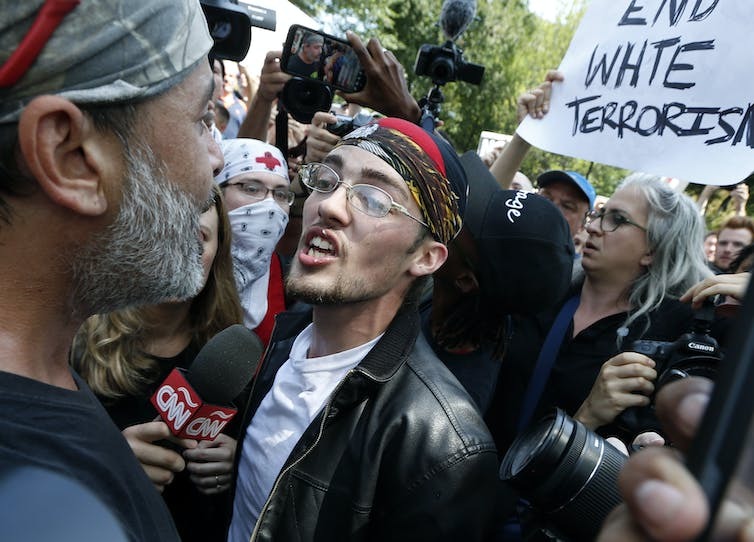 President Trump tried it again during the largely peaceful protests in Boston – he called the tens of thousands who gathered there to protest racism and Nazism “anti-police agitators,” though later, in a characteristic about-face, he praised them. This violence, and the rhetoric about it coming from the administration, are echoes – faint but nevertheless frightening echoes – of a well-documented pattern, a pathway by which democracies devolve into dictatorships. There’s an additional wrinkle: the antifa. When Nazis and white supremacists rally, the antifa are likely to show up, too. “Antifa” is short for antifascists, though the name by no means includes everyone who opposes fascism. 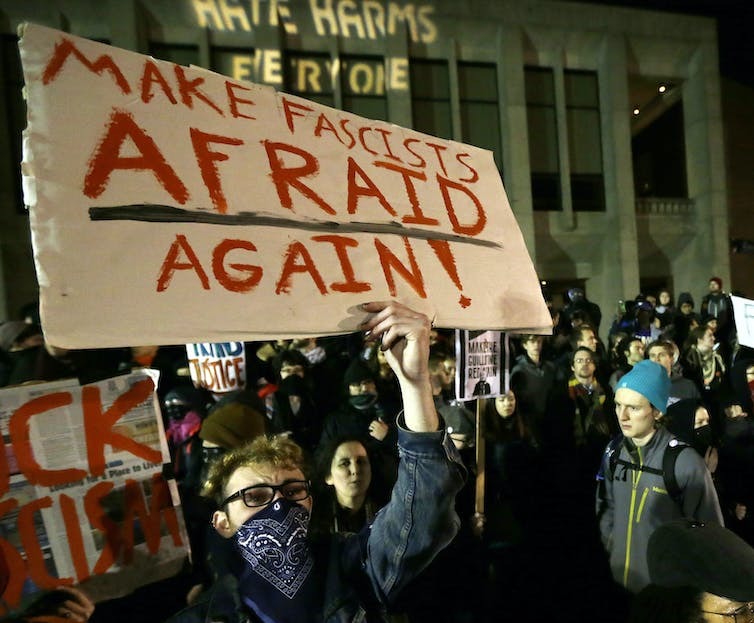 The antifa is a relatively small movement of the far left, with ties to anarchism. It arose in Europe’s punk scene in the 1980s to fight neo-Nazism. The antifa says that because Nazism and white supremacy are violent, we must use any means necessary to stop them. This includes physical means, like what they did on my campus: forming a crowd to block ticket-holders from entering a venue to hear a right extremist speak. The antifa’s tactics often backfire, just like those of Germany’s communist opposition to Nazism did in the 1920s. Confrontations escalate. Public opinion often blames the left no matter the circumstances. This does not mean ignoring Nazis. It means standing up to them in a way that denies them a chance for bloodshed. The cause Heather Heyer died for is best defended by avoiding the physical confrontation that the people who are responsible for her death want.